Are you interested in science? Do you love the sea? Then get to know what marine science is all about! 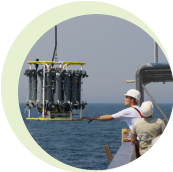 Experience what it feels like to work on the sea in an international team, taking samples and analysing them, and trying to find answers to relevant questions. This Science Camp brings together young science freaks from Sweden, Denmark, Lithuania, Poland, and Germany - all in all a group of up to 25 students accompanied by marine scientists and teachers. The working language will be English. To give you a better impression, we made a film about the camp of 2010.